Soaking yourself inside a hot tub is really a great way to end your tiring day. In addition to the relaxing feeling that it gives, there are actually a lot of health benefits that your hot tub can give you, such as the removal of toxins trapped in the pores of your skin, as well as hydrotherapy, a revolutionary kind of therapy which makes use of water, usually in hotter temperature. With all of that in sight, it is very important for you to get the best suited type of hot tub for you. Nowadays, there have been lots of hot tubs available for customer consumption. These hot tubs vary in style, designs, key features, and functionalities. That is why it is a good idea to first know what is the type that you are looking for, so that you would know what to look and where to look. Generally, hot tubs occupy a great deal of installation space so if you do not have unlimited space to begin with, then you could consider investing on smaller version of hot tubs, or on space-smart hot tubs such as the corner hot tub. Why choose corner hot tub? The first reason in purchasing corner hot tub is because you have a limited installation space. 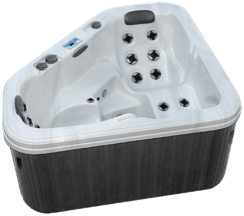 Companies that produce these kinds of hot tubs make shapes like triangular corner hot tubs, which could accommodate up to three people. Although some of these hot tubs are the smaller scale of large hot tubs, it does not necessarily mean that corner hot tubs are just the smaller version. These hot tubs are specifically designed for small spaces. Another reason is because most corner hot tubs, including its kind, are portable, meaning you could carry them wherever you would like to enjoy your hot tub at, which can either be indoor or outdoor. It is really space-smart because if these hot tubs can’t be installed inside your house, then you could still do it outside. As said a while ago, corner hot tubs are not just the smaller version of larger hot tubs, because they are specifically designed for a smaller installation space. These corner hot tubs have their own water mechanisms such as water just that could reach up to more than ten in number. In addition, cornet hot tub has a lighting system, which can be LED, and typically they are very water proof. The features of the corner hot tub varies along its type. Some examples are the Island Escape Spas which are known for its user-friendliness, having a digital control system. All you have to do is select, then click the specific setting that you want to experience while relaxing yourself. What a time to be alive! But that is not the only feature of the said spas, because there are also a lot of water jets aimed at different angles like your feet, back, neck, and shoulders. In addition, it also has a very good lighting and as for the accommodation, it can hold up to three people inside. Other examples of corner hot tubs are the Reflection Spas, which has several types, based according to the increasing number of features such as the water jets and other water mechanisms. It even has a waterfalls.